Poaching eggs is easier than you think and a great way to cook eggs without adding fat. Using cauliflower for the hash instead of potatoes keeps the carbs down for this quick and easy low-carb breakfast. Served over a bed of vitamin-rich kale, this delicious hash takes minutes to prepare and gives you the protein and nutrients you need to start your day. Sweat the onion gently in a pan on low heat for about 2 minutes. Add the cauliflower and cook another 2 minutes, then add the kale and continue cooking until kale brightens and softens, about 2 minutes. Season to taste with salt. Bring a small saucepan of water to a slow boil. Add 1 tablespoon of vinegar. Crack the eggs gently into the water to poach, cooking for 2 minutes. Make sure the water does not boil too hard. 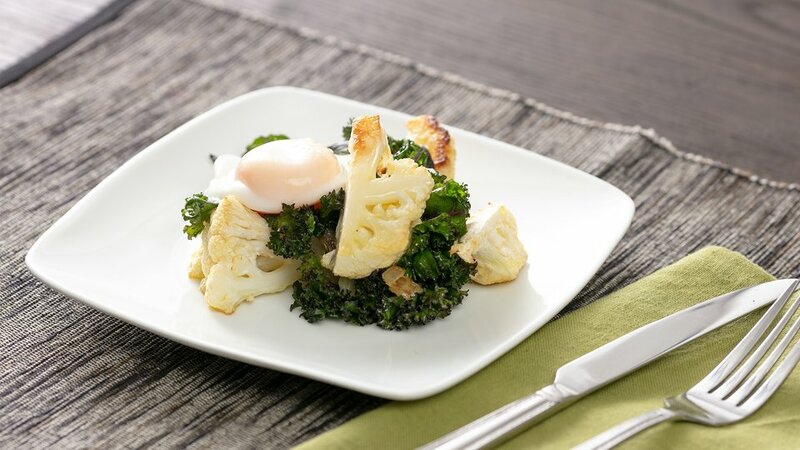 Use a slotted spoon to retrieve the eggs and serve over the cauliflower and kale hash.